Upper Mustang Trekking is an off-the-beaten-path which is least explored. Shuttered by the walls of Annapurna, Dhaulagiri, and Nilgiri on the north, Upper Mustang is an unexplored heaven. The region presents you with a lost culture of the forbidden lands of the past. Upper Mustang covers the northern two-thirds of Mustang District of Dhaulagiri Zone in Nepal. It is still popular as the Kingdom of Lo. Upper Mustang lost its official monarchical recognition with the new reforms in the Government of Nepal in 2008. But, the last monarch, Jigme Dorje Palbar Bista (born c.1933), is still revered by the citizens as their king (raja or gyelpo). This is the reason Upper Mustang fame as the “Last Lost Kingdom of Nepal”. Until 1992, foreigners were not allowed to visit the place which earned Upper Mustang the term ‘Forbidden Kingdom’. This history of Upper Mustang made it one of the most popular trekking routes of Nepal. The territory of Upper Mustang remained isolated from the 14th century. The time when this walled city was found and built by the warrior Ame Pal in 1380. The current unofficial King traces his lineage back to that time and the founders. Such isolation from foreign world rendered it possible for this place to preserve its culture and heritage. Till this date, we can observe this traditional Buddhist Kingdom the way it was all the back when founded in the 14th century. The local residents of Upper Mustang are the Lobas. The language, tradition, customs, and heritage is very much similar to the neighboring land of Tibet. And with centuries of seclusion from alien influence, what visitors observe is a real treat. The land untouched by the modern realms makes the experiences surreal for the visitors. Upper Mustang trekking offers a visual treat with its fringes of snowy peaks. The barren treeless semi-arid terrain receives very less rainfall. So, it is the high desert-like rain shadow of the Himalayas. Low precipitation has made this region dry and parched, like the bordering Tibetan Plateau. The walled medieval capital of Upper Mustang has a name Lo Manthang. Stepping through the town gate into the capital offers a vista of narrow alleyways, long walls of beautiful prayer wheels. And herds of farming animals in the ‘Lost Kingdom’ is an amazing sight to behold. The architectural extravagance in Lo Manthang exhibits the four-storey royal palace. And the beautiful monasteries like the Thugchen Gompa built in the 15th century. Or, the city wall itself. The amchi museum and school are a must visit to further comprehend the heritage. You will witness the pattern of the history passing from generation to generation. You can take a short stroll to a small monastery and a century old cave dwelling situated high in the rocks. Two weeks of this ultimate trek route promises to be an adventure in its own separate rights. And, being in the rain shadows of Annapurna and Dhaulagiri ranges, Upper Mustang is favorable even during the rainy seasons. When is the best time for the trek? What is AMS and how to avoid it? A least of two trekkers accompanied by a Nepali guide with a valid license issued by Nepal Government is demand-able for a permit. You cannot go on this trek independent. Upper Mustang Trek Permit cost USD 500.00 per person for first 10 days. But if you spend longer than that you need extra USD 50.00 each extra day per person. You do not need a TIMS card for this trek. Upper Mustang is a rain shadow area and monsoon is hardly an issue to trek here. For this trek, the best season is from mid-February to end of November. Trekking in December and January is impossible due to extreme cold and heavy snowfalls. Moreover, the Tiji festival of the monsoon season is highly recommended. The festival is bound to be one of the most memorable experiences in a trek of the Upper Mustang. Pre-monsoon/Spring (March to May) and post-monsoon/ Autumn (October to November) are the best time to visit and trek many places in Nepal. But Upper Mustang, unlike many other destinations of Nepal, is the best during monsoon because of the Tiji festival. 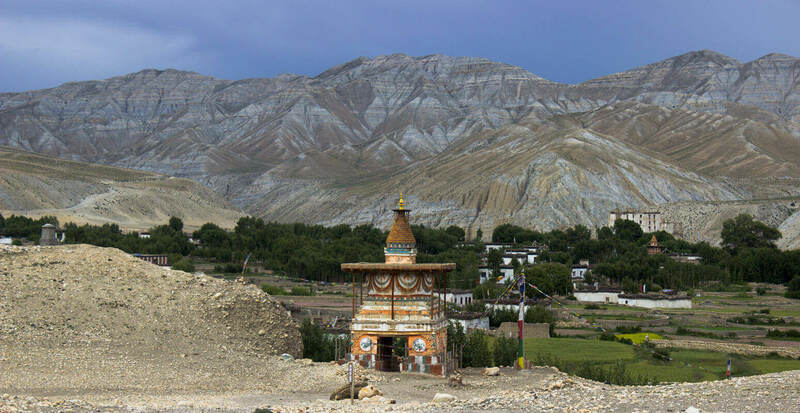 Upper Mustang trek is no doubt fun, and the best part is, it is suitable for all age groups. The trek includes reaching an alleviation of almost 3900m. Though altitude sickness is not common in alleviations under 4000m, it is always beneficial to know about this condition. The medical term is Acute Mountain Sickness (AMS). Altitude sickness, or AMS, is a pathological condition that occurs in altitudes above 1500-2000 m. When you face acute exposure to low partial pressure of oxygen at high altitude you feel the problem. This may happen to anyone. AMS is serious enough to be fatal if not taken serious actions. But a little care from the trekkers is enough to tackle this problem. The common symptoms of AMS are: breathing difficulty, dizziness, headache, nausea, and vomiting. Plus, loss of appetite, fatigue, swelling of body parts, nosebleed, drowsiness, and insomnia. When symptoms of altitude sickness are noticeable, you must take immediate actions. Anti-altitude sickness pills (Diamox or Acetylzolamide) are compulsory in your first aid kit. You must consume it in severe conditions. The best approach would be to head down to lower altitudes. Prior experience in trekking is not mandatory. But it is good for trekkers to follow a routine (like walks or jogs) for a couple of months beforehand. It helps increase one’s stamina in the high altitudes and battle with shortness of breath. We discourage heavy medications. Especially, you need to avoid sleeping pills because they are a respiratory depressant. They will add problem at high altitudes. Required equipments and first aid, accompanied by a guide should be enough for a safe trek in Upper Mustang. It is always advisable to carry water purifying tablets in first aid kit. Mineral water bottles are not always available in the remote areas of Nepal. Most places may demand consumption of open-water from the natural source. To drink water directly from the sources, you must use purification tablets. Personal hygiene is always essential, but during treks, it is of utmost importance. An upset stomach or an infection is not something you want on a trek in Nepal. Always carry a hand sanitizer. Use it before meals, after using toilets, and after shaking hands with other people. Do not eat ice or snow from the altitudes. A doctor won’t do any good without his equipment, likewise, trekking requires necessary equipment and gears. You can bring supplies, gears, and equipment from home or you can buy it in different places before starting the actual trek. This article may prove to be helpful in deciding where to buy the required stuff. The Tenji/Tiji (local- “Teeji”) festival is an annual event indigenous to the unofficial capital of Upper Mustang, Lo Manthang. Tenji festival is abbreviated form of Tempachhirim which translates to “prayer for world peace”. The celebration extends for three days. This festival commemorates the victory of Buddha’s incarnation DhorjiSonam over a demon called ‘Ma Tam Ru Ta’. The dance performed by the monks of Lo Manthang chhyode Gumba during these three days festival enact the harassment of the said demon. The birth of Dhorjisonam (the demon’s son) and an attempt by Dhorjisonam to return the demon to the Buddha realm. The monks perform a dance called” TsaChham “on the first day of the Tenji and “NgaChham” on the second day. On the third day, a there’s a ceremony called “RhaChham”. For this ceremony, one monk has to stay in the seclusion for three months of winter. He prepares for the role of Dhorjisonam for RhaChham. The monk in the role of Dhorjisonam throws an effigy and Tsampaa representation of Ma Tam Ru Ta, the demon. There’s a belief that this celebration cleanses the village from evil souls. The Tiji Festival for tourists means enjoying all the dances and celebrations that take place. It also includes horse racing and a giant tug-of-war. Tibetan women in their traditional clothing and colorful jewelry bejewel the ceremony. Plus, monks and dancers clad in their robes and elaborate costumes. This is a festival that is hardly known to outsiders. Those who have experienced describe the ceremony to offer surreal experiences. Several teahouses are available even in the higher points in the Upper Mustang trek. So, there is no need to carry tents for accommodation. The lodging services are clean and of basic standard. The limited number of teahouses has friendly staffs ( with good English). And, they serve the exquisite local dishes in the teahouses. The recent road connection to the capital, Lo Manthang has brought a considerable drop in the price of the food available. Variety of the eastern, as well as western style dishes, is available in the tea houses of Upper Mustang. If you are planning to eat and stay in the same place, it will be economic for you rather than eating in one and staying in the other. This is because the major business of people in these places comes from the food consumed by tourists rather than the accommodation provided. So, like most of the trekking destinations in Nepal, Upper Mustang also features a cheaper accommodation in comparison to food. But, during the Tiji festival, you need to pre-book for accommodation and food. Or, you can carry your own tent. Accommodations cost ranges from $3 to $6 in the trekking route. And the cost of a single meal is also around the same range.